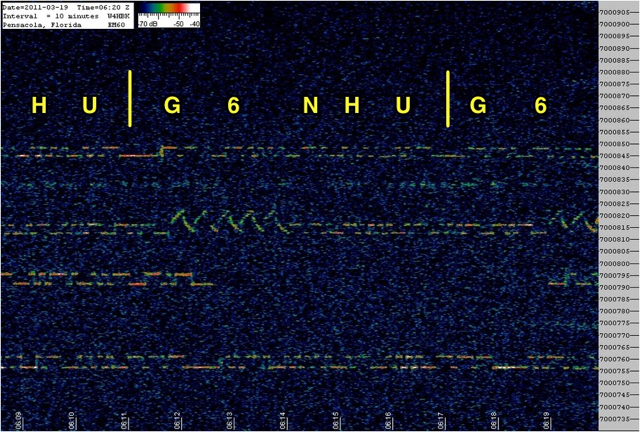 I posted an entry to this blog a couple of days ago about my 40m QRSS transmitter which I left online that night. I wasn’t grabbed by anyone and so I planned to have it running during the weekends because I was advised that W4HBK’s Pensacola Snapper generally switches to 40m on Friday nights. I switched it all on at around 21:30 last night and after a while decided to see if I could check the frequency to make sure I was in the right place so I fired up the rig with no aerial connected and tuned to the bottom end of the 40m band. I could hear myself nice and strong on what sounded like approximately the right frequency but something didn’t sound right, I could hear the variation in tones as the keying circuit did what it was supposed to do but it certainly wasn’t QRSS Morse, it sounded more like 12WPM to me. A quick and careful disassemble of the unit from the box ensued, I fitted the appropriate link and put it all back together, switched it on and listened to the tones – Perfect. Now I wanted to check the frequency properly. Colin, G6AVK suggested I use Argo, a QRSS viewer to monitor my own transmission and see what frequency I was on so I downloaded it and spent ages getting it configured correctly for the radio so that it would display my frequency correctly. One of the biggest problems I had was that because I was such a strong signal I was getting multiple traces of myself and I had to switch in the attenuator, wind the RF gain back to almost nothing and reduce the output of the microHAM USB Interface III almost to zero in order to get a good clean trace. I managed it though and here’s the output of my 40m QRSS transmitter monitored locally. You can see at the far left where I was still reducing the levels, there’s a very bright part as the levels were still coming down. There’s also a very slight drift in frequency downwards as the transmitter was warming up. Once that was done I had to double check the frequency. I thought I was on around 7.000.850 which was roughly where I wanted to be but I thought my deviation at about 7-8Hz was too high. The setup guide for the QRSS transmitter suggests 4-5Hz and says “do not waste spectrum by using more!”. I adjusted it as best I could and ended up with it at around 3.5Hz although my frequency had taken a hit and gone very high so I grabbed a screwdriver and readjusted it down to to roughly where I was before. Then it was pretty much midnight so I went to bed. The signal stayed there until 07:40 where it faded away to nothing. I’d managed to get the frequency correct as well, you can clearly see that I was pretty much where I thought I was, just 5Hz lower at 7.000.845 and that may just have been some drift as the transmitter warmed up. 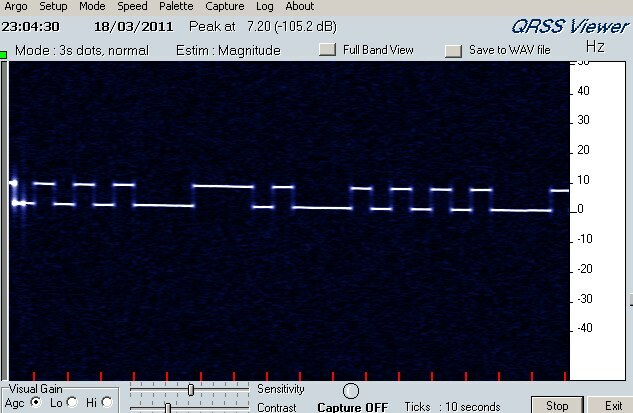 I’m very pleased to have been grabbed during my first real night of QRSS transmission on 40m. I’m running approximately 150mW from a QRP Labs QRSS transmitter kit to my random length wire fed with an SGC Smartuner. I’ve got around 20m of RG58 coax going into the tuner so I’d hate to estimate how much power is going into the tuner, never mind how much is actually going into the aerial! This entry was posted in Amateur radio, Construction, CW, HF, QRSS and tagged QSO365. Bookmark the permalink.